Easy peasy. - A Life From Scratch. Don’t you just love when a recipe comes together so easily but looks so much more involved? It’s the perfect fake out. Shhh – don’t tell anyone. Something about this recipe screams gourmet. Maybe it’s the fresh ricotta that sloooowly melts down into the ridges of the gnocchi – or the freshly cracked pepper that sits on top, giving the ricotta a bit of edge. Or perhaps its the bright green color from the freshly cut green beans or peas. Whatever it is this recipe is ready to be a regular in your meal routine. Whether it’s for a quick mid week dinner or to be served in a huge bowl for your guests Saturday night. We enjoyed it last night in deep bowls with the fire crackling in the background. Doesn’t get much better than that. Cook the gnocchi according to the package directions. Meanwhile, bring a large saucepan of water to a boil and add some salt. Cook the green beans until tender, about 3 minutes. Drain. 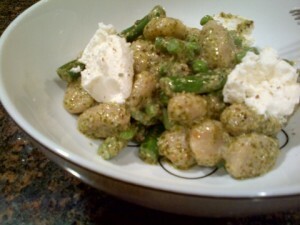 Add the pesto and cream to the gnocchi and cook over medium heat, stirring, just until heated through. Stir in the green beans and peas to warm. 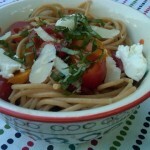 Divide among bowls and top with spoonfuls of ricotta and freshly cracked pepper. Perfect way to end the week. Summer sauce that cooks itself. Delicious! And I think even my 2 year old son would like it! 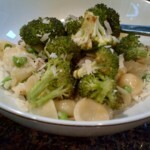 Yeah, I just bought gnocchi and had no clue what I was going to do with it! 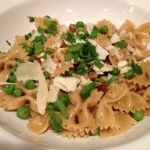 Thank you for the awesome recipe Courtney:) I love using peas too whenever I can to sweeten things up! 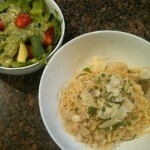 I made this tonight for my husband and I- DELICIOUS! Thanks for the recipe!